THE LEADER OF the so-called New IRA in Dublin was today jailed for life for the murder of another dissident republican almost six years ago. Kevin Braney (44), of Glenshane Crescent, Tallaght, Dublin 24 was found guilty by the Special Criminal Court last Monday of the “premeditated” murder of Peter Butterly (35). 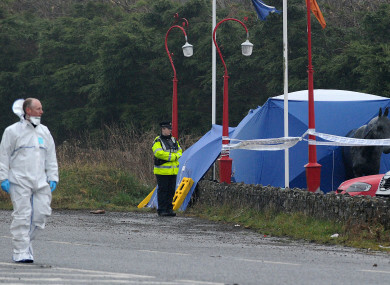 Butterly, was chased and shot dead outside The Huntsman Inn, Gormanston, Co Meath in view of students waiting for their school bus on the afternoon of 6 March, 2013 in what the three-judge court said was not “a spontaneous act”. The father-of-three died from gun shots wounds to his neck and upper back. Braney had pleaded not guilty to murdering Butterly. Delivering judgment last Monday at the non-jury court following an 11-week trial which ended in December, Mr Justice Paul Coffey, presiding, said the court was driven “irresistibly” to the conclusion that Braney was involved in the organisation and planning of Butterly’s murder beyond a reasonable doubt. In his opening address on 4 October last, prosecuting counsel Paul O’Higgins SC told the court that Braney “is said in effect to have been the man who gave the orders…and is shown to have had an extensive involvement”. Braney had denied membership of an unlawful organisation, styling itself the Irish Republican Army, otherwise Oglaigh na hEireann, otherwise the IRA on August 2, 2017. An impact statement was read to the non-jury court by the victim’s wife, Eithne Butterly, during Braney’s sentence hearing this morning. Kevin Braney, you have no concept, nor do you really care how we feel but I am going to tell you regardless. Peter was an excellent, loving and proud father to our three children and their lives without him to protect and nurture them have been horrific to say the least. “Our two daughters were his princesses and he absolutely adored the two of them. He participated in so many ways in their childhood and their love of sports was an enormous bond between them. Peter attended and supported the girls in so many of their activities and was always the proudest daddy of their many achievements,” she said. Mrs Butterly said her son was only six years of age when she had to tell him that his daddy was shot dead and that he was never coming home. “His scream is a scream that I will never forget and still haunts me to this day. He was only a baby,” she said. Addressing Braney, she said that he had denied Peter participating in his many sporting activities and her son gets “so angry about this”. “Can you blame him”, she added. “Peter was a loving and devoted husband as well as my best friend and our lives without him are literally a living nightmare. And thankfully we have so many wonderful memories that you can never take from us,” she concluded. Mr Justice Coffey, presiding, sitting with Judge Martin Nolan and Judge James Faughnan, then sentenced Braney to the mandatory term of life imprisonment, backdated to when he first went into custody for this matter on 14 September, 2017. Cummings asked the court that a “nolle prosequi” be entered on the outstanding count of membership. This means the State will not be proceeding with the prosecution in relation to this count. Following sentencing Braney gave little reaction before he was led away by prison officers. Giving the court’s verdict last Monday, Mr Justice Paul Coffey said the prosecution’s case was that Braney was part of a common design to procure the murder of Mr Butterly. Convicting Braney four days ago, the judge said the circumstantial evidence connected the defendant with Butterly’s killers Dean Evans and Edward McGrath as well as with The Huntsman Inn. Edward McGrath (37), of Land Dale Lawns, Springfield, Tallaght, Sharif Kelly (49), of Pinewood Green Road, Balbriggan and Dean Evans (27), of Grange Park Rise, Raheny, Dublin have all received life sentences at the Special Criminal Court after they were convicted of Butterly’s murder. Email “Leader of so-called New IRA in Dublin given life sentence for murder of dissident republican”. Feedback on “Leader of so-called New IRA in Dublin given life sentence for murder of dissident republican”.